Your Soul is Split, You Are of Many Minds: What Does it Matter? “As I see our “reality,” humans are an integral part of the physical universe. Humans have free will, the freedom to choose our course through life. A natal chart limits your options, of course, but it also provides unique new options. We craft our life through free will choices – choices make a difference. But no matter what course we choose, we are on a journey toward soul maturation, toward wisdom. Thus while I love a good alternate universe story, based either on the theory that there are either exactly eleven alternate universes or on an infinite number, I can’t see how alternate universes work in terms of soul growth from experiencing the consequences of choices and actions. That is, if at every point of choice in your life you actually make all possible choices, generating a plethora of alternate universes – are you splitting your soul? Generating new souls? How does one soul learn if there are no definite consequences of choices, i.e. all choices get chosen? In such alternate universes, you may meet alternate versions of yourself – or “you” might be dead, or never born. So what of your soul? Vertical time travel, forward or backward, likewise poses me philosophical problems, but has more room to combine reincarnation with time travel. Perhaps you go back to teach yourself a lesson, or pay the price for misbehavior, or rescue a soul-mate, or even to change history to fix your current life. Ah, such a good question. I think the underlying assumption of so many books on survival of consciousness, analyses of religious traditions, and the observations of “New Age” philosophies is that our soul is destined, or somehow intended, to “progress”. The concept of karma depends on the notion that questionable past behavior, misdeeds, unkindness, or cruelty of any kind will result in judgement and retribution in a future life. Most of what I have read on Near Death Experiences involves a stage where the soul must face his/her “life review” and confront the pain that he/she has caused others. There are entire books dictated from the “Other Side” where this process is revealed, and a multitude of authors in diverse fields of specialization seem to be in agreement that your actions in this life determine your future life, either on earth or in some nebulous “in-between” state. I am profoundly uncomfortable with that assertion. If it is true that those who suffer in this life are simply working out bad karma, then we could reassure ourselves that when disaster strikes in Haiti, there is a cosmic purpose to it all, and the dead and dying are working out their debts from previous lifetimes–therefore, we don’t have to feel guilty or compelled to try to help, since this is all pre-ordained and pre-determined by forces greater than ourselves. Who are we to interfere with the justice of the Universe? On the other hand, I suppose, one could argue that if we don’t help or extend ourselves, we are damaging our own karma. The next time around, it might be us desperately clinging to life after a catastrophic natural disaster. The problem with the entire concept of karma is that there is really no evidence for it. The late Dr. Ian Stephenson and Dr. Jim Tucker from the Division of Personality Studies at the University of Virginia carried out–and Dr. Tucker is still active in this area–the most extensive research into reincarnation anyone has ever attempted. Their findings after decades of research in multiple countries, do NOT support the notion of karma. There is no connection between one’s fortunes in a past life and one’s current situation. In other words, when this issue is studied in-depth, the entire idea that we progress spiritually over time is called into question. While the concept of cosmic justice is very appealing to us all, we have to base that belief on faith, since the evidence shows otherwise. This brings me to a second common assumption: we have free will, and we can choose when, how, and why to act. Therefore, we can control our destiny. Recently I read a fact that floored me in Dr. John Turner’s Medicine, Miracles, and Manifestations: A Doctor’s Journey Through the Worlds of Divine Intervention, Near-Death Experiences and Universal Energy, which leads me to believe that perhaps there is no such thing as free will. Brain and consciousness research have demonstrated that our brains decide to act fractions of seconds BEFORE we are consciously aware that the decision has been made. In other words, the brain is actively plotting out our next moves before the action occurs, before we can initiate the behavior or the action, and certainly before we are aware of having made a choice to act. For Dr. John L. Turner, a neurosurgeon, consciousness has not been demonstrated to exist within the brain–he believes it comes from without, not within, and his conclusion is upsetting: our decisions are pre-programmed. Free will, as we are consciously aware of it, does not exist. So far, we have evidence for two theories: karma does not actually exist, and we do not possess free will. To these, I will add a third from Ms. Lichtenberg’s quote above: quantum mechanics postulates the existence of multiverses, where various versions of “us” exist in different states of being. We are split into various levels–or dimensions, or fields–of existence based upon choices we make. If every decision splits us into sub-categories of universes, then there are infinite numbers of us out there, following different tracks. What does that mean for free will? If we are free to make any decision we wish, but that decision creates a division and a new reality for the person who made said decision, then we have countless versions of “us” evolving differently. How can those other versions possess anything like a soul or an identity? There can be no “original” of us, since this process of undifferentiated splitting has been going on continuously since we came into existence, or since we were able to make decisions–which begs the question, how do we define the term, and at what point in our development were we capable of consciously “making a decision”? 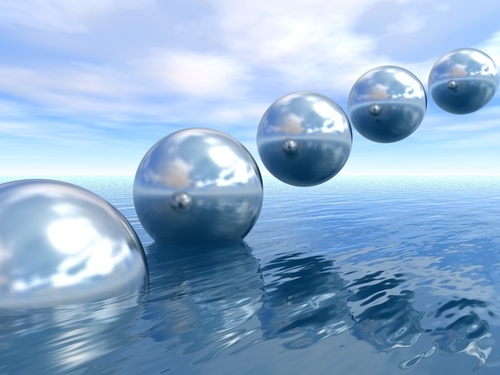 I have my issues with the “multiverse” theory in quantum mechanics, but let’s allow that it could be true. If we are not held accountable for our actions in another life, then what happens to us after death is fairly random or determined by human decisions regarding such mundane issues as a desire for revenge, a need to continue a relationship with a particular person, an obsession with a place or family member, or some secret motivation that has nothing to do with progression towards the Divine. Now, if it’s true that the brain is somehow receiving signals from an outside source (non-local consciousness) and that we are not aware of the programming but simply following the Plan (from whence, I wonder, does this pre-programmed Plan come? ), then we do NOT make free choices, but follow a script that was already written for us. Who or what wrote that script is beyond my capacity to theorize. If we are blindly following a pre-written Plan, then we do NOT control our destiny, we cannot assert that we are moving towards soul evolution, and we can only hope that someone or something provided us with a decent template for our lives. Otherwise, we’re just screwed. Now add to all this the idea that there are multiple versions of us in countless splinter universes, and the belief that we are evolving over time or that we are becoming closer to the Divine is simply untenable. For one thing, there are apparently many of us, without awareness of the future or an ability to control it, and without a system of rewards or punishments for our behavior and actions. What are we left with? I’m not sure, but it’s not Heaven and it’s not Nirvana. It appears to be an endless recycling of consciousness following a track, a plan, or a cycle over which we have no control or input. However, if my decisions split me into different possibilities, then the idea of free will creeps back into the picture. Maybe one particular version of me is a lazy, depressed and narcissistic another version of me is productive, happy and deeply engaged with the world; but that would require the lazy, depressed version of me to make a decision to be otherwise–in which case, am I the living result of a conscious decision that another version of me has made? OK, so my head hurts now, and I should probably end these speculations. What makes sense to me at this point is that we shouldn’t expect life after life to appear radically different from what we are experiencing now. Reincarnation is not necessarily a moral evolution or a compass that leads us to a better self, or to God. If we experience life as chaotic, random and unjust, we will probably experience the next life in the same way. If we experience this life as purpose filled, divine and awe-inspiring, it makes sense that we would continue to experience life that way. Whether or not we control the blueprint of our existence(s) may not be as important as how we perceive our reality, for our perception of ourselves and our lives will certainly create all the worlds we inhabit down the line, as it determines the content of our world as we are living it now.